Housed in a 17th century building in the center of historic Beaune, France, The Cook’s Atelier is a culinary destination for food and wine lovers. Our family-founded French cooking school, culinary boutique, and wine shop highlight the local artisan food producers and winemakers of Burgundy and France. We offer culinary workshops in our Atelier teaching kitchen and host intimate gatherings in our private dining room, with menus inspired by the bountiful markets of Beaune. Our workshops and gatherings are informative and entertaining, as we believe the process of cooking and dining around the table should be savored and wholeheartedly enjoyed. Guests come from around the world to learn more about Burgundy through cooking in our kitchen, and to experience the relaxed conviviality of sharing a meal together around our table. Our culinary boutique is a carefully curated selection of beautiful, unique items for the passionate cook's kitchen and home. 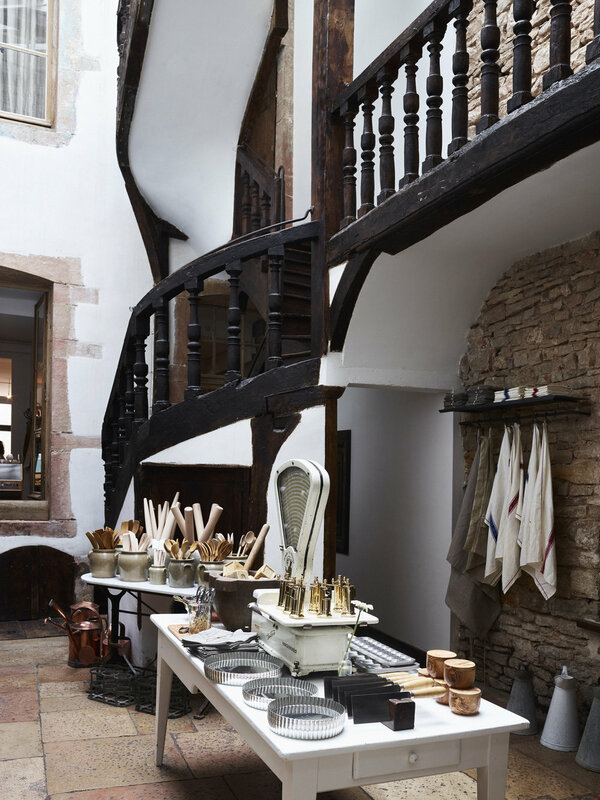 Encouraged by past clients who were interested in sourcing some of our favorite items for the home and kitchen in their own homes, we have created a collection of practical, well-made classic French and European cook’s kitchen tools and homeware from small artisans that we trust. We are also proud to serve the best coffee in Beaune! Our artisan coffee is roasted over open flame from one of Italy's premier artisan coffee roasters in Verona. We source all of our beans from Laboratorio di Torrefazione Giamaica Caffè, and now sell them in the shop and online as well and serve guests daily from our vintage 1957 FAEMA machine. If you are not able to visit us in Beaune, our online shop offers a special glimpse of some of our favorite finds from our culinary boutique and wine shop. Some of our favorite items make up our collections in Kitchen, Copper, Vintage Home, and Wine. We personally source, package, and ship each order! We take great care in communicating with each and every client, whether it's for organizing a cooking workshop, private dinner or purchasing an item from our boutique. Each and every item coming from our boutique is lovingly hand-sourced and beautifully packaged. We are thrilled to be able to share a little bit of The Cook’s Atelier with others from around the world. It's a shop for cooks, created by cooks. We work with cook’s tools that are as beautiful as they are useful at The Cook's Atelier. We have no interest in collecting gadgets, but rather curating a collection of practical, well-made classic French and European professional-style kitchen tools that we can one day pass on to our children and grandchildren. There are certain high-quality provisions that we always keep on hand in our pantry. Along with regular staples such as lentils, dried legumes, capers, various vinegars, finishing oils, and homemade preserves, we believe it is important for cooks to have plenty of items on hand to create an impromptu meal at home. Our larder includes a growing collection of spices and quality ingredients sourced from artisans from around the world. We are particularly fond of one-of-a-kind vintage finds that are beautiful, as well as functional in the kitchen and home. If you come visit us here in Burgundy, you'll find various pieces proudly displayed in our Atelier kitchen, dining room, and boutique. Throughout our time living in France, we've collected a vast array of unique antique items, like French creamware, earthenware and yellowware, sturdy copper pots and pans and delicate pastry tins, soup tureens in various sizes, mixed flatware, and luxurious linens, to name a few. All of our vintage treasures are of high quality and in excellent condition! We find beauty in the patina and enjoy using our vintage treasures every day. We find joy in continuing to search for and sourcing the perfect vintage treasures for others and take pride in adding to our Vintage Home collection on a regular basis. We have a soft spot for copper cookware - many of our favorite pans have been collected for over 30 years. Our French copper pots and pans are our treasures and play an intricate part of our daily cooking. Not only are copper pots and pans beautiful to look at, they are the perfect choice for serious cooks. Our professional grade copper cookware line is well-made and will last a lifetime or more. Our line is crafted by the makers at Mauviel, a small but legendary copper manufacturer in Normandy, France. The company was founded in 1830 in a tiny town known for over 800 years for its copper production and embodies the French tradition of professionalism and timeless elegance. Each piece is branded with The Cook’s Atelier - Beaune, France. Like all great art, these pots and pans continue to gain value over time. Our classic collection of M'héritage Mauviel copper consists of cookware that is 90% copper and 10% stainless steel. Each pot and pan is equipped with brass handles. The combination of copper and stainless steel make up the thickness in both collections. - M'150 collection consists of a 1.5mm thickness and the M'250 is a professional thickness of 2.5mm. The copper allows for unsurpassed heat conductivity and control, and the stainless steel interior is ideal for all daily cooking needs for home and professional cooks alike. We share the French passion for pairing wine with food at our Atelier. We love getting to know local winemakers, and hosting winemaker gatherings. In the same way we source quality ingredients for our food, we are also passionate about selecting well-made wines. In our wine shop, we carry a carefully curated selection of small production bottles that we love to drink, from France, Italy, and Germany. Of course, we have a soft spot for Burgundy wines, and have a unique selection from our favorite local producers. If you are not able to visit our wine shop, we are happy to ship wine throughout the world. Please view our description and attachments specific to the US and other countries for more information on wine shipments. All of our wines are personally selected, and we take pride in our relationships with each winemaker and the story behind every bottle.